NEW YORK and TORONTO, Feb. 5, 2019 /CNW/ - iAnthus Capital Holdings, Inc. ("iAnthus" or the "Company") (CSE: IAN, OTCQX: ITHUF) and MPX Bioceutical Corporation ("MPX") (CSE: MPX; OTC: MPXEF) are pleased to announce the closing of the previously announced plan of arrangement (the "Arrangement") under the Business Corporations Act (British Columbia) pursuant to which iAnthus acquired all of the issued and outstanding common shares of MPX (the "MPX Shares") pursuant to the terms of an arrangement agreement, as amended, among, inter alia, iAnthus and MPX dated October 18, 2018 (the "Arrangement Agreement"). 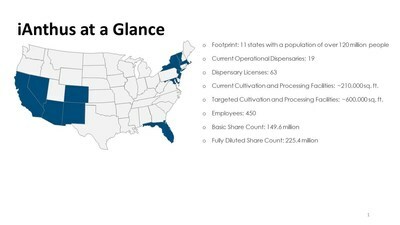 The combined company (iAnthus and MPX), now has operations in 11 states that will permit iAnthus to operate 63 retail locations and 15 cultivation/processing facilities. As a result of the business combination, iAnthus has added retail and/or production capabilities in Arizona, Maryland, Nevada, California, Massachusetts and New Jersey. These additional licenses complement iAnthus&apos; existing assets in New York, Florida, Massachusetts, Vermont, Colorado, and New Mexico, forming super-regional footprints in both the eastern and western United States reaching over 121 million potential customers. "With iAnthus&apos; operation increasing in size from six to 11 states, we plan to take advantage of this opportunity by unveiling unified national retail and product brands across the organization," said Mr. Ford. "We realize that as the cannabis market continues to grow, the need for strong national brands only increases. With our ambitions to be the leader in the U.S. cannabis market, that is our logical next step. Stay tuned, as we plan to unveil further details around this in the coming weeks." Immediately prior to the closing of the Arrangement, all directors and officers of MPX resigned and MPX is now a wholly-owned subsidiary of iAnthus. iAnthus will expand its board of directors to seven members. Current board members Hadley Ford, Randy Maslow, Julius Kalcevich and Paul Rosen will be joined by MPX&apos;s nominees Robert Petch, Elizabeth Stavola, and Robert Galvin. Dr. Richard Boxer has resigned from the board of directors of iAnthus to make way for one of MPX&apos;s nominees and will remain with iAnthus in the role of Chief Medical Officer. Mr. Ford added, "On behalf of iAnthus and MPX, I&apos;d like to thank Robert Petch and MPX&apos;s special committee for their support of this transaction." Statements in this news release that are forward-looking statements are subject to various risks and uncertainties concerning the specific factors disclosed here and elsewhere in iAnthus&apos; periodic filings with Canadian securities regulators. When used in this news release, words such as "will, could, plan, estimate, expect, intend, may, potential, believe, should, our vision" and similar expressions, are forward-looking statements. Forward-looking statements may include, without limitation, anticipated benefits associated with the business combination with MPX, the delisting of the MPX Shares, the cessation of MPX as a reporting issuer, the listing of MPX International on the CSE, the size of iAnthus&apos; retail footprint, iAnthus&apos; national retail strategy, and other statements of fact.